Brandon Lattu, Fairfax Avenue south of Pico Boulevard, Los Angeles, February-March 2010. Part of "How Many Billboards? Art in Stead" temporary project organized by the MAK Center for Art and Architecture. "Lattu has chosen the automobile for his subject, both as a nod to the viewer who is quite likely navigating traffic while pondering the piece, and to allude to corporate products that dominate billboards, whetting and capitalizing on human desire. The Cadillac Fleetwood shown in Lattu's piece, in production from 1927 to 1996, came to be associated with the pinnacle of luxury, repeatedly served as the U. S. President's vehicle, and was the most common base model for both the limousine and the hearse. 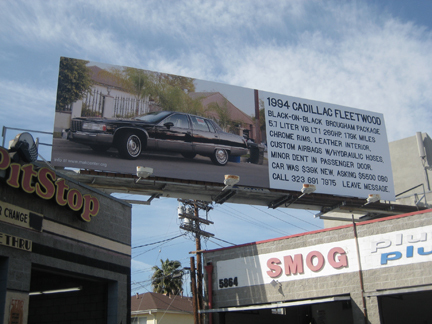 The visual presence of a former icon of affluence on a present day billboard highlights the passing of time, and positions current objects of advertising as transient and soon to be relegated to history." - text from a longer description by Kimberli Meyer, http://www.howmanybillboards.org/, accessed 03/2010.